My sister went to the Farmer’s Market, picked up a few delicata squash, and gave one to me. She had no idea what would happen next…. 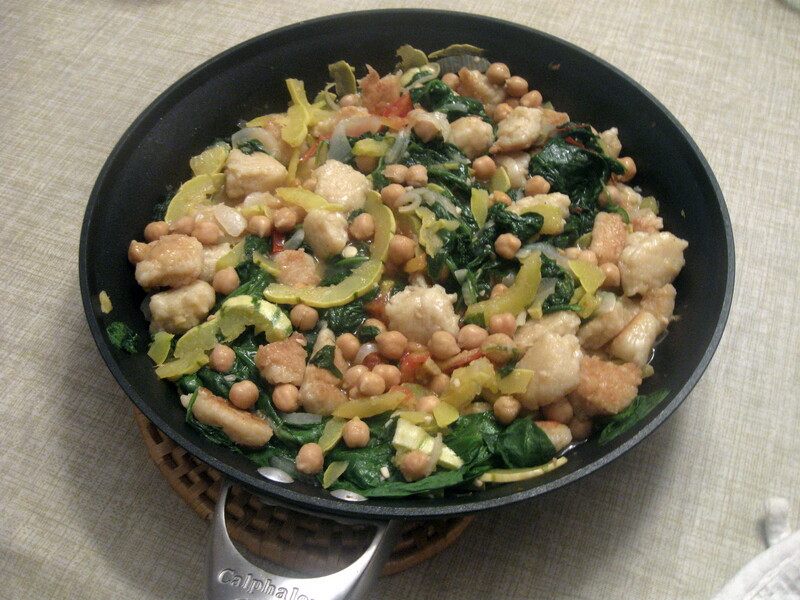 It all began with this recipe from Eating Well, one of my favorite sites. I started by pouring balsamic vinegar in a saucepan, to make the balsamic reduction for a garnish. Meanwhile, my Mom had leftover mashed potatoes in the freezer, so we decided to make our own gnocchi. It’s pretty simple with just potato, egg, and flour, except the dough required about twice as much flour as usual. With flour just about everywhere and dough on our hands, we smelled something burning, and realized the balsamic was in fact reduced to a smoking mess on bottom of the saucepan. Things got a little easier from there. I took out a big frying pan, and sauteed the sliced delicata squash with onion and garlic. Then I added vegetable broth and covered the pan until the squash was softened. I added the gnocchi, spinach, chickpeas, and some sliced tomato, and cooked it until everything was done. We had a little balsamic left for drizzling, and some Parmesan cheese for the top. Finally, dinner was served. Putting all the mess aside, this actually turned out really well! Things were so hectic that I didn’t do a lot of measuring and timing, but I would still suggest the recipe. But maybe you should just buy the gnocchi…. You may have seen the One-Pot Spaghetti recipe and pictures on Facebook, Pinterest, and various blogs. I’m not sure of the true origin, although many roads lead to Martha Stewart. I’ve seen a lot of references, but I chose the Italian Wonderpot recipe from Budget Bytes to guide me. Most of the ingredients are pantry staples, and you can assemble the pot within just a few minutes. Some versions include red pepper flakes for a little extra heat. I kept thing simple with minced garlic and Penzey’s Pasta Sprinkle. 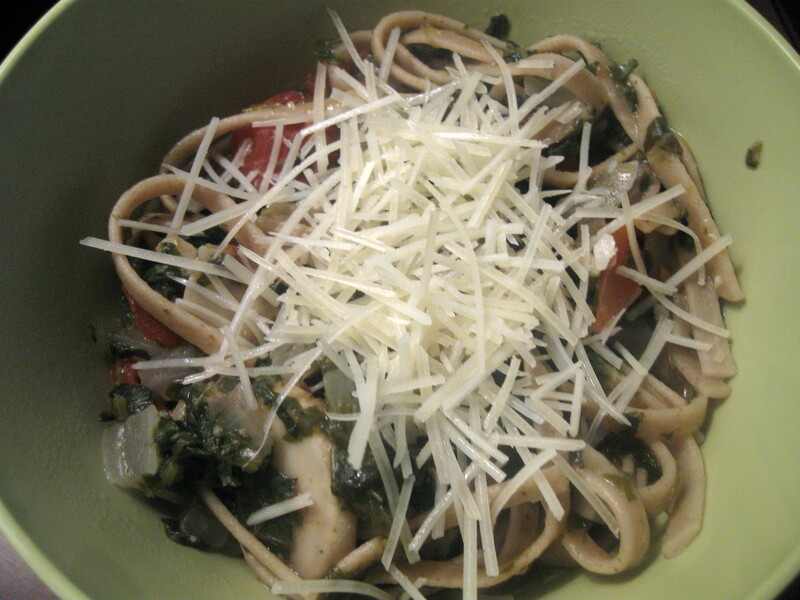 Although this doesn’t have the complexity of a gourmet pasta dish, it has a good taste and works well as an easy meal. There’s plenty leftover for lunches too. Double win! Place ingredients in a large pot, in the order written. Make sure that ingredients are covered by liquid. Cover pot, and bring to a rapid boil. Remove cover, and boil for 12-15 minutes, stirring every few minutes, until most of the liquid is absorbed. Garnish with freshly grated Parmesan cheese. It was a fabulous weekend at the beach, with plenty of fun in the sun. Everyone in my family loves Caprese salad with fresh tomatoes, mozzarella, and home-grown basil. With a little inspiration, we turned the salad into delicious grilled sandwiches. I didn’t include amounts in the recipe below, but use your intuition and you won’t go wrong. You do want to be sure to keep the grill on fairly low heat; the bottom of the bread burned in a few places which made for some crispy sandwiches. Just enjoy them on the deck, and no one will have to clean up the crumbs! These fancy grilled cheese sandwiches are perfect for either lunch or happy hour. They were a great way to celebrate the true arrival of summer. Mix olive oil and minced garlic. Brush one side of bread slices, and place facedown on grill. Cook for 1-2 minutes, until just lightly browned. Turn bread over, and place tomatoes and mozzarella on bread. Close grill cover, and cook for 3-4 minutes. Place basil leaves on mozzarella. 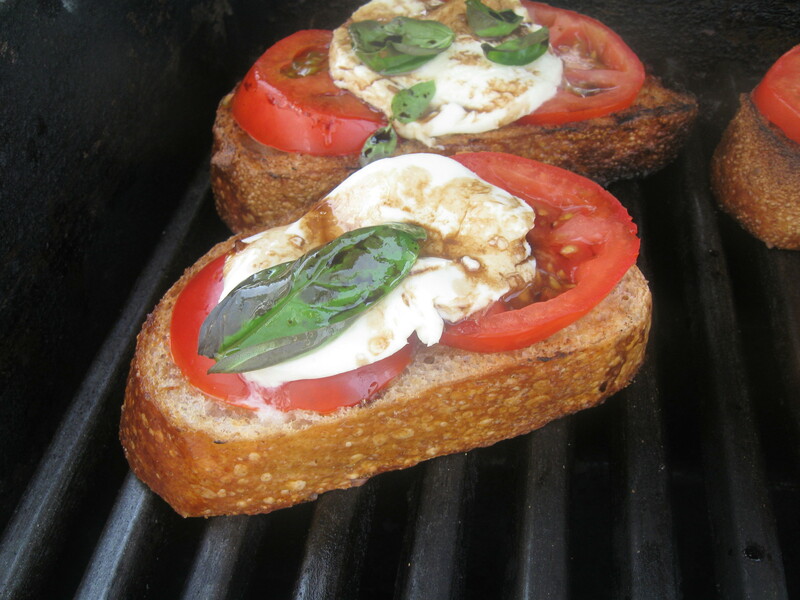 Remove sandwiches from grill, and drizzle with balsamic vinegar. Have you taken a good look at the frozen vegetables at your grocery store lately? Of course, there is nothing like fresh, preferably local, produce. But frozen is just as nutritious, and sometimes a lot more convenient. 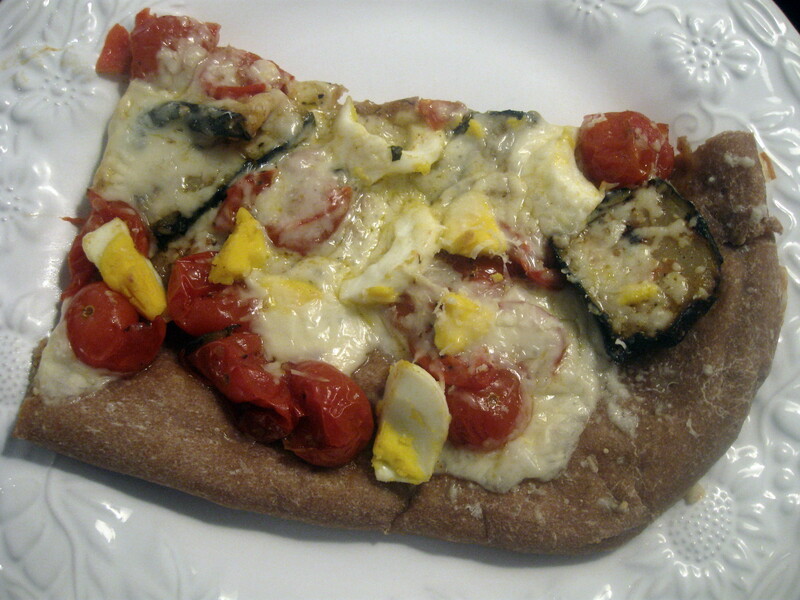 I used the zucchini and tomatoes to make this simple flatbread. I added hardboiled eggs for just a bit more protein, and enough cheese to add flavor without overwhelming the vegetables. It was just about perfect! Moral of the story? Next time there’s a hot day and the farmer’s market is closed, spend a little time in the freezer aisle. 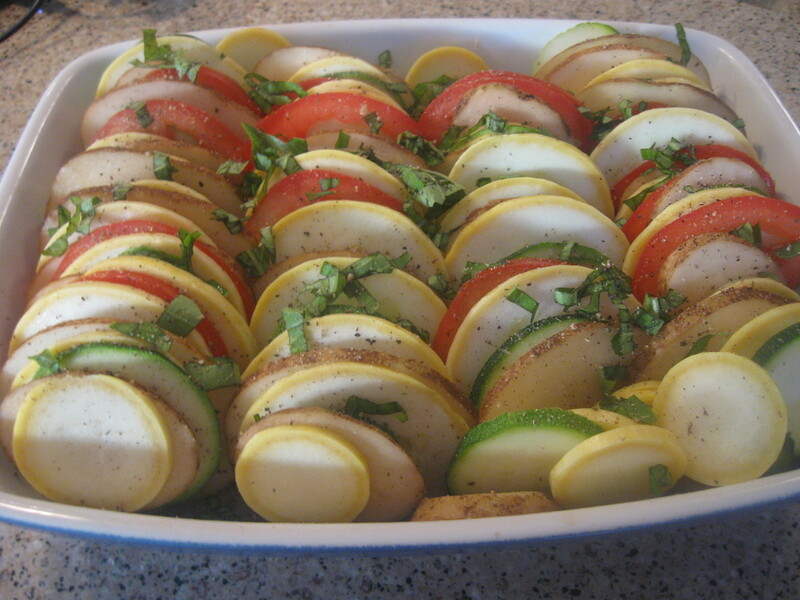 Place tomatoes and zucchini in a glass dish, and drizzle olive oil. Roast at 375F for 30-40 minutes, until tomato skins are cracked. Spread dough into a rectangle on a cookie sheet, extending as far to the edges as possible. Spoon vegetable mixture onto dough. Top with chopped eggs, and sprinkle cheeses. Bake at 375F for 15-18 minutes. Finally, a recipe that seems fitting for a summer holiday weekend. 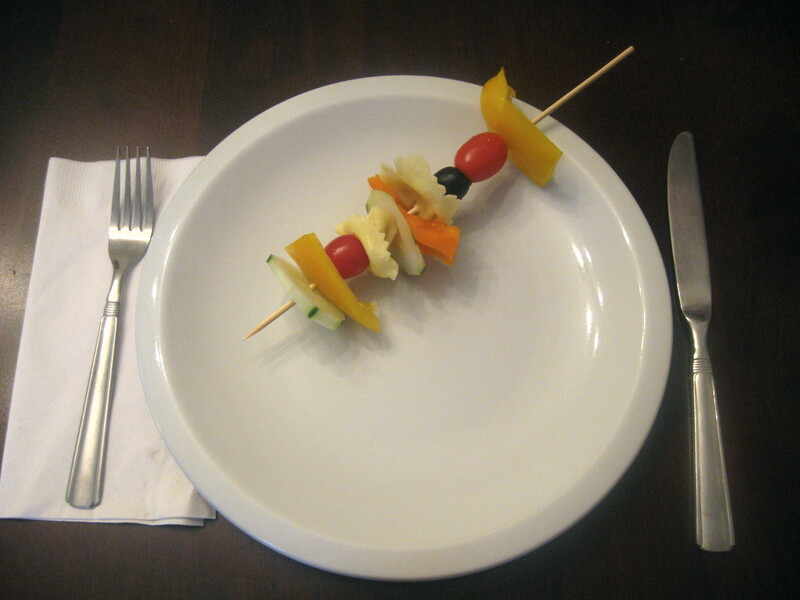 I made these Pasta Salad Skewers for my cooking club, inspired by a pin that I saw from Babble. They are meant to inspire kids to eat vegetables, but I think they’re fun for adults too! I used cheese tortellini, grape tomatoes, peppers, cucumber slices, artichoke hearts, and olives. The original recipe included fresh basil leaves, which would have been a nice touch. 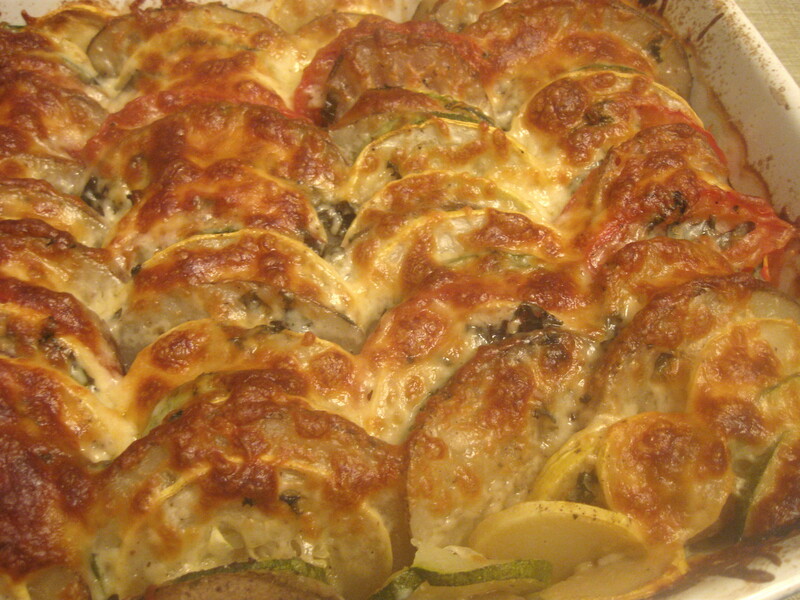 You could even include grilled vegetables like onions, zucchini, and mushrooms. The skewers are a clever way to serve pasta salad, and would complement any BBQ. I offered a salad dressing for “dipping” that’s not pictured. Whether you make these skewers or not, have a great Memorial Day! I got on a roll last weekend with my crockpot, and after cooking a turkey breast, I used it to bake potatoes. I got the idea from a Budget Bytes post, and just had to try it myself. She baked white potatoes, but I wanted to try both white and sweet. The method is simple. First, you wash the potatoes and pat them dry. Then, prick them with a knife in several spots. Rub them with a little olive oil, and wrap them up on foil. Place them in the crockpot, and cook on High for 4-5 hours, or Low for 8-10 hours. That’s it! 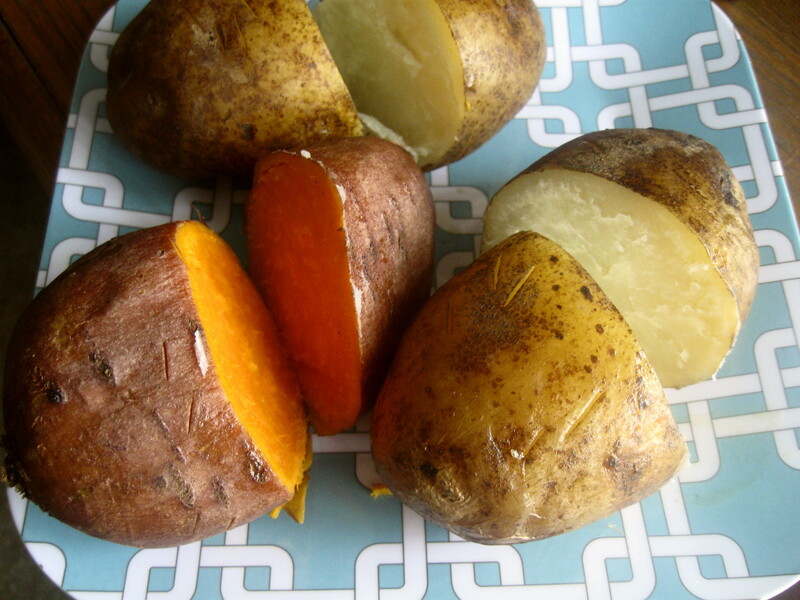 The original recipe warns against crowding too many potatoes in the crockpot, so I cooked 2 white potatoes, and 2 sweet potatoes. Both of them came out great! In a blind taste test, I don’t think I could tell the difference between a traditional baked potato and the crockpot version.